Thinking about cockroaches may be a little gross for some people but knowing about the cockroach’s life cycle goes a long way in dealing with roach problems. Just consider the fact that for every cockroach visible, there are numerous more hidden away and all of them are in various stages of their lives. Moreover, the high adaptability of these insects makes us wonder about how they form. On a practical note, knowledge about roach’s life-cycle comes in handy especially for pest control services as it allows them to carry on their work more efficiently. 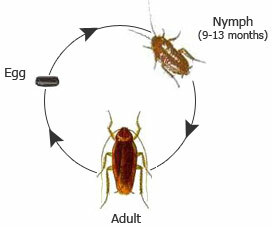 The life cycle of a cockroach comprises three distinct stages – the egg, the nymphand the adult stage. The egg stage starts with the eggs being laid in cases that contain up to 40 eggs. These cases are either kept hidden to keep them safe or are carried around on the back of the cockroaches until they hatch. The egg stage then gives way to the nymph stage, when the bodies of the cockroaches emerge and are quite soft. It is during this stage that the roaches go through successive phases of molting by which their bodies gradually harden and their color changes. The roaches increasingly begin to look like adult roaches after successive stages of molting and the roach assume its final shape. Many types of roaches develope wings at this stage. Young adults may look nymph-like, with the only thing distinguishing them from nymphs being wings. Considering that up to 40 eggs may be carried by a female cockroach, it is not surprising that cockroaches can take over your home in no time. Knowing about the life-cycle of a cockroach is not that enticing, but it sure is something that is handy if you are dealing with your roach problem. In addition to knowledge about the life-cycle of cockroaches, knowing about different kinds of cockroaches can also help you target these little creatures.